Keolis Downer strives to meet passengers’ expectations, in all their diversity. Through our Keoscopie surveys we investigate the impact of national and regional socio-demographic changes on mobility trends. This innovative approach helps us develop a customised mobility strategy, in line with citizens’ needs. In order to understand the impact of the digital revolution on mobility around the world, Keolis conducted a research to identify digital mobility trends in 13 major smart cities spread over five continents: Abidjan, Boston, Dubai, Hong Kong, Hyderabad, London, Lyon, Melbourne, Montreal, Sao Paulo, Shanghai, Stockholm and Tokyo. The findings of this research can be found in our World Mobility Report. This research enabled us to identify and analyse 400 digital innovations. The study brought to light three major expectations shared by passengers throughout the world. ‘Real time’ updates : Whether looking for timetables, service availability, tailored travel itineraries or alternate routes in the event of service disruptions, passengers want up-to-the-minute information and transport solutions. Personalised : Citizens no longer want generic timetables and maps. They want personalised information that is tailored to them, responding to their travel needs and personal situation at any given moment. This reflects the movement from a mass-transit focused approach to one of personalised mobility. ‘Step-by-step’ directions : Passengers are also looking for door-to-door guidance, a digital pocket guide, covering every step of their journey. As Australia’s largest private multimodal transport operator, Keolis Downer is excited to be contributing to developing smarter mobility solutions that will benefit communities. We see autonomous vehicles and demand-responsive transport options becoming in the very near future a vital part of the multimodal journey. 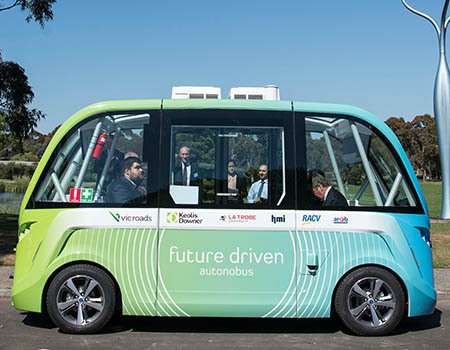 Keolis Downer has formed a consortium to trial driverless shuttles on the La Trobe University campus in Melbourne. The consortium partners are key commercial and technical partners, including La Trobe University, HMI Technologies, the Royal Automobile Club of Victoria and the Australian Road Research Group. The trial is intended to develop relevant regulations and/or legislation to enable autonomous vehicles to take their place as an everyday part of our cities of the future. We will be evaluating community reactions to this technology, the better to design the most flexible, broad and successful multimodal transport solutions possible. Keolis Downer has also formed partnerships to trial on-demand services in the northern beaches area of New South Wales and Sydney’s north-west. Along with AECOM, CSIRO/Data61, JYW Consulting and the University of New South Wales, Keolis Downer will ensure that these pilots help the New South Wales Government fulfil the objectives stated in its Future Transport Technology Roadmap. These include unlocking the full value of the existing transport network, while personalising transport services to create a better experience for customers. The aim of the AV trial and on-demand pilots is to deliver reliable and affordable first and last mile services that meet local needs and encourage the use of public transport. The pilots and trial aim to integrate the new transport services with existing ones to improve mobility for all passengers. This will apply to both high demand and low demand routes, and result in faster, safer, more personalised and more convenient trips. Keolis Downer believes that autonomous vehicles and on-demand passenger transport services are the way of the future. Unlocking the potential of existing transport networks and further personalising transport services will contribute enormously to future communities and their demands.